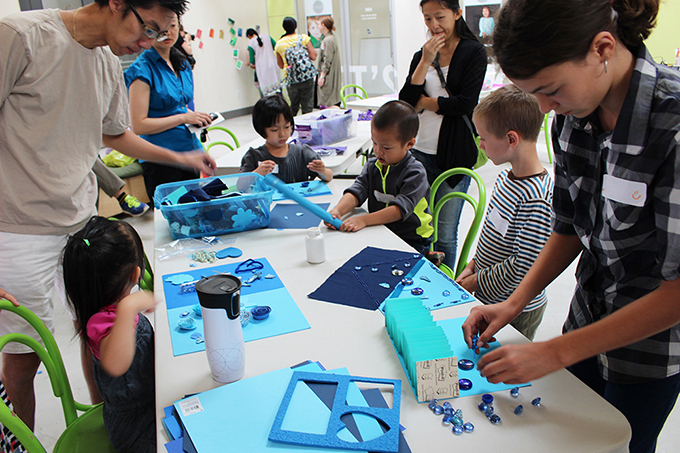 July's ArtStarts on Saturdays and ArtStarts at River Market events were an exploration and celebration of colour. 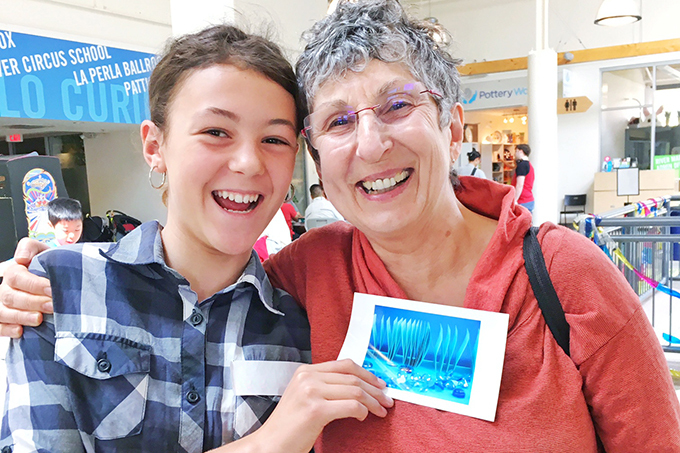 Photographer, artist and instructor Carolyn Sullivan joined the ArtStarts team to share some perspective on colour theory and lead families in bright and fun hands-on workshops. Carolyn started her Rainbow of Colours workshop by reviewing the colours in the rainbow. While most children knew red, orange, yellow, green and blue, they often jumped to purple and pink rather than indigo and violet. It took the kids no time at all to remember the new names, however. Kids and parents stood around seven tables—one for each colour—organized in a half circle (or arc-en-ciel!). Before jumping into the activity, Carolyn gauged her crowd and offered a little more learning: she explained what monochromatic design is, wherein in all colours and parts of the design are a shade or hue of the same colour. A particularly astute kid was able to answer Carolyn’s questions about why and when we see rainbows. (For those of us who need a refresher, the refraction of light in water droplets shows the whole spectrum of colours in an arc shape in the sky). A boy chimed in to add that they typically follow rainstorms and that the water droplets are in the clouds. 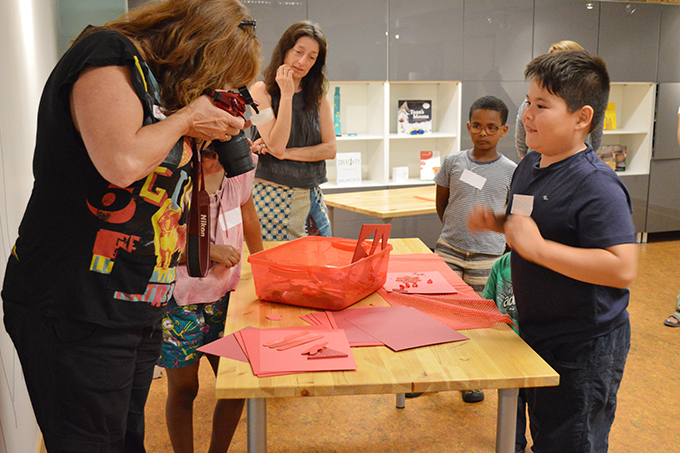 Carolyn then described the activity: kids were challenged to create a design using the items at a colour station, such as paper, sparkly cut-outs, plastic doodads and more. 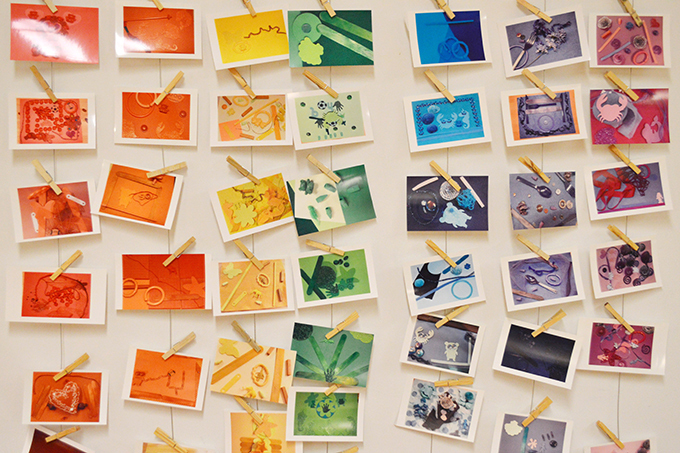 When they were ready, a volunteer took a photo of their work and printed it on an instant photo printer. These types of printers process the images and print in steps of different coloured inks (cyan, magenta, yellow and black—or CMYK) so the kids had to be patient while their photo went in and out of the miniature machines. Everyone was encouraged to make a couple of designs: one to bring home and one to contribute to a community rainbow hung on the wall. The results were absolutely brilliant. 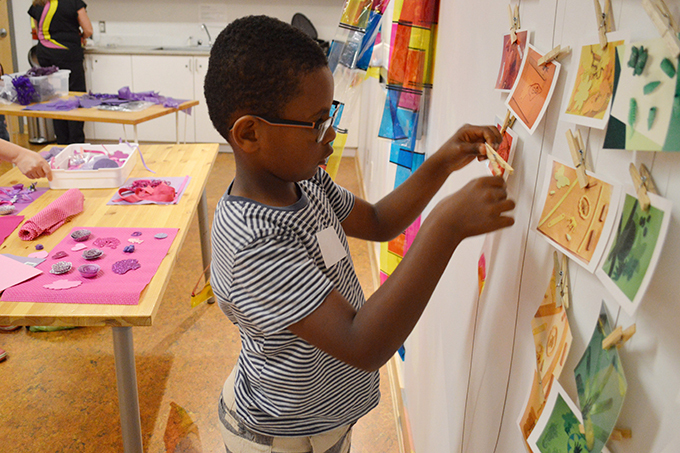 The initial designs were all well done, but as the workshops progressed, some of the kids branched out and got really creative. Without prompting, we started to see 3D designs and dioramas that added a dynamic element to the photographs. 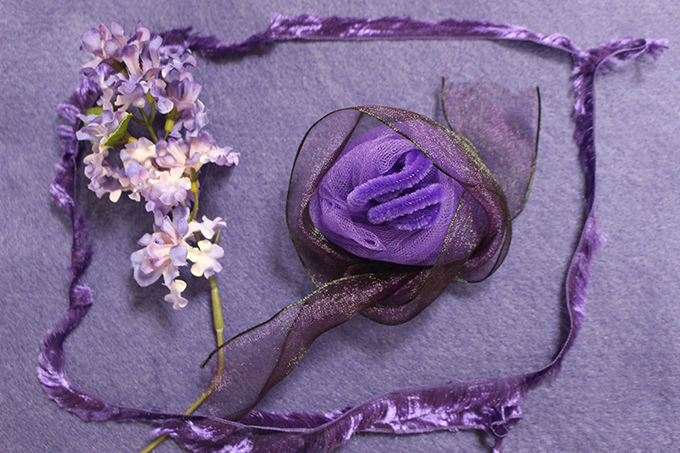 One little girl and her mother created an origami flower to place on their indigo design and another young woman used an accordion of post-its to set the backdrop for hers. 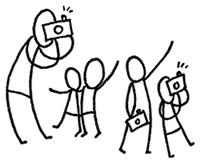 It was a busy two days, with volunteers jumping back and forth between taking photos for the kids and printing them out for them to hang. 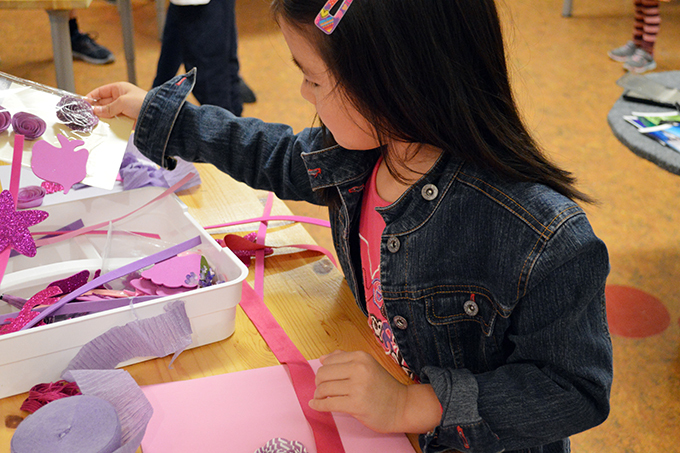 The busyness was all worth it to see the amazement on kids' faces as their designs came to life. The message of the workshop ended up being more than just colour theory. Landing on the same weekend as Vancouver Pride, we took the opportunity to talk about inclusivity, diversity and being part of a community. Always a lesson worth bringing home. We look forward to seeing you again at the end of August! Join us to Jump, Bend, Sway, Twist and Shake! in movement workshops with with Lee Kwidzinski and Anthony Hutchcroft. Engage your imagination in this energetic class that explores creative movement with live percussion, music and props. Lee Kwidzinski is a dance educator and expressive arts therapist who is passionate about the power of arts in education and healing. Her partner on percussion is Anthony Hutchcroft. Join us at ArtStarts on Saturdays at the ArtStarts Gallery in Vancouver on Saturday, August 27 or at ArtStarts at River Market in New Westminster on Sunday, August 28. Learn more.